• Library Media Specialist Evaluation Manual - State of Alabama. This extensive document is available in Adobe Acrobat format. • Idaho's School Librarian Manual - There are evaluation forms for school library media specialists and for students library aides. This document is in pdf format. • Guidelines for Performance-Based Library Media Specialist Evaluation - State of Missouri. This is in pdf format. • Evaluation of School Library Media Specialists - an extensive method by the South Carolina Department of Education. • Library Media Specialist - National Board for Professional Teaching Standards. • Standards of Professional Excellence for Teacher Librarians - by the Australian School Library Association. • Performance Management and Appraisal: A How-To-Do-It Manual for Librarians (How-to-Do-It Manuals for Libraries, 132) - G. Edward Evans, Neil-Schuman, 2004. Collaborative Peer Coaching That Improves Instruction: The 2 + 2 Performance Appraisal Model. Allen, Dwight W. & Alyce C. LeBlanc. SAGE Publications, 2004. I have been the Library Director at Bellarmine College Preparatory, a Catholic Jesuit high school for boys, in San Jose, CA for 10 years. I am a frequent contributor to School Library Journal's Media Review and Library Journal's Book Review. Accountability builds success. It allows all parties to ascertain how well goals and aspirations are being met. Independent schools must be accountable to a plethora of interested parties, including students, parents, benefactors, and other educational institutions. 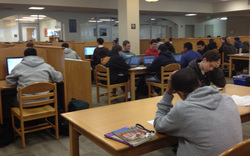 Within the school, accountability is assessed on many levels including individually. Assuming that the whole is equal to the sum of its parts, the collective assessments of the school’s workforce would equate to the accountability of the institution as a whole. Though assessments and evaluations are seldom eagerly anticipated either by the person being assessed or the assessor, they can be constructive tools that build relationships. From the assessor’s point of view an assessment should promote understanding of the work that is expected relative to the work which is performed. For the person being assessed, an assessment should reinforce exemplary work and draw attention to tasks which need improvement. In a perfect world, an assessment would be a win-win activity. 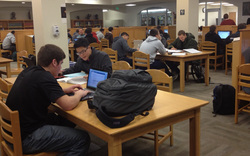 Bellarmine Prep students work in the library.